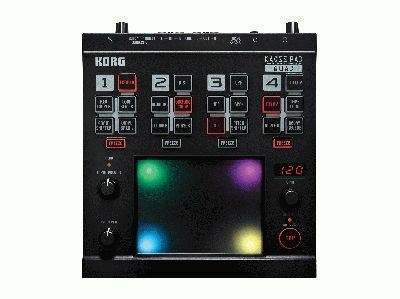 Over a decade ago, Korg changed the DJ/music scene with its first-generation Kaoss Pad, a touchpad-based effect controller. Since then, the popular X-Y touchpad has appeared in many Korg products. Now, Korg is taking effects control one step further with the new Kaoss Pad Quad, which employs new effects, functions and features that let users create their own combination of Kaoss effects with simultaneous control of up to four effects in real-time using a single fingertip on its touchpad. Any audio source can be processed: an MP3 player, a mixing board, an instrument or even vocals via the unit’s mic input. As users tap, slide or move their finger across the intuitive X-Y touchpad interface, the effect parameters will change, producing dramatic real-time transformations in the sound. The brilliant, colorful LED touchpad illuminates in an intense variety of colors, which change depending on the state of the effects, the BPM setting and hand motions on the touchpad. Designed to be both usable and highly playable as an effect processor, the Kaoss Pad Quad allows the user to simultaneously control up to four effects from the touchpad. Each of the four effect modules – Looper, Modulation, Filter and Delay/Reverb – contains five options (plus a module kill), for a total of 1,295 combinations. Effects are chosen directly from the front panel for easy access during live performance. By rhythmically adding successive effects, or switching effects on and off as a song progresses, the Kaoss Pad Quad can add variation and development to the structure of any song. Even the simplest beat can be creatively affected to produce something entirely new. Another unique feature is the Freeze button, which offers even more versatile control of effects. For each of the four effect modules, Freeze memorizes the position at which the user was last touching the touchpad, effectively “freezing” the state that effect was last in, even after release of the finger. By touching the touchpad again while Freeze is enabled, only the “unfrozen” effects will be controlled. Additionally, the proprietary Auto BPM engine automatically detects the tempo/BPM of the song that's playing or the audio source. Users can also use the BPM knob to make fine adjustments. Alternatively, the BPM can be set manually using the Tap Tempo function.